Slice the lemon into thin slices approx 0.5cm. In a medium sized oven tray (big enough to comfortably fit the thighs) add 100g of olives and half the lemon slices, set aside. In a large frying pan heat 1 tbsp olive oil, season the chicken and brown on both sides. When the thighs are browned turn off the heat and add 2 crushed garlic cloves and 1 tbsp of honey. Mix together well. Lay the chicken thighs on top of the olives and lemon. Add the rest of the lemon slices, scatter the tomatoes around the chicken and add 50ml of water. Season with salt and pepper. Bake in the oven for 20 to 25 minutes until the thighs are cooked through. While the chicken is cooking make the couscous. In a saucepan heat 1 tbsp of olive oil, add the couscous and gently fry for 2 minutes then add 400ml of boiling stock. Simmer for 15 minutes stirring occasionally until the couscous is soft throughout and the stock has been absorbed. You may need to add a little extra water. Season to taste. When the couscous has been cooking for 5 minutes put the broccoli on to boil or steam, and cook until just tender. Season with salt and pepper and add some butter. Finely chop 3 tbsp of parsley, add 2 tbsp to the couscous once it is cooked and save the rest for garnish. 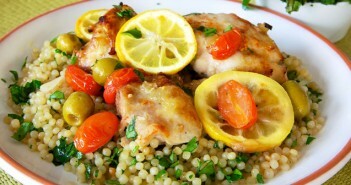 Remove the chicken from the oven and serve with the couscous and broccoli. Sprinkle over the remaining parsley. Any chicken left over would be very tasty eaten for lunch the next day. This dish can be made in advance. You can use vegetable stock instead of chicken stock.